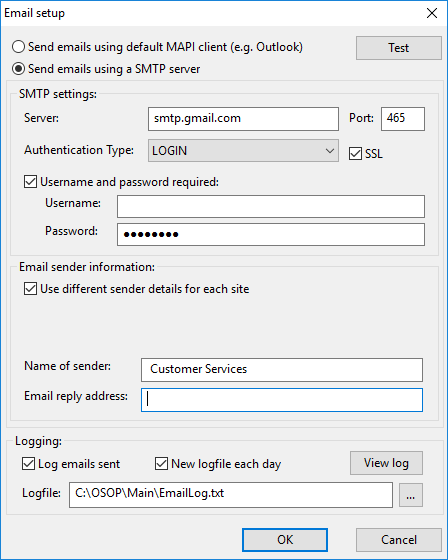 If you choose an SMTP server you need to enter certain information depending upon your host (or ISP). These settings can normally be copied from your existing email client. The settings to copy are those specified in your Outgoing mail server (SMTP). Some ISPs, for example, Freeserve, only allow you to send email from their SMTP server. Some SMTP servers may not use the default port (of 25) or use SSL (port 465). Also they may require you to use your given name and password. Below are some examples of values to use for different ISPs. One Stop Order Processing should automatically find the correct connection type. This can be used by setting the Authentication Type to Automatic. If this does not work correctly or you want to use a specific connection type this can be selected from the available list. When you send an email you need to identify who the mail is from and a reply address. If you want to use a different email address for each site tick the Use different send details for each site.